Here's a nice little time-killer for you. The image you see below is a screenshot from Syobon, a Japanese Mario-look-a-like game. Doesn't look very interesting, does it? 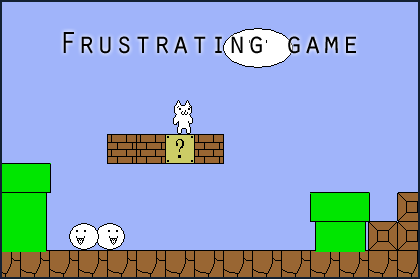 But I'm sure, that if you're going to play this game, you'll get pretty frustrated some times. But it'll be funny too, especially when you let others play. The video below will explain more. I wasted over 200 lives in this game, but couldn't get passed chicken in the castle level when you have the sword. As you can see in Syobon, it does look like the world of Mario. The video below shows that there even is a Mario modification that is just as frustrating as Syobon (Adult language used). Just like Syobon, pretty funny to watch, but don't think it's still funny when you're playing. Does anyone know who created that kind of levels?